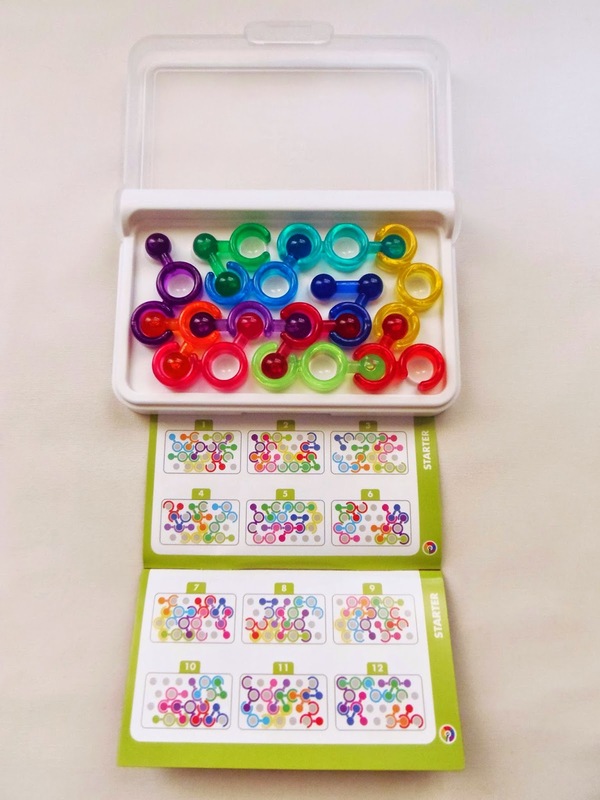 4 Plaques is an interesting puzzle from Jean Claude Constantin, very much different from the packing puzzles he usually makes. It's also not much of a surprise, since he often makes other kinds of puzzles, which is always welcome. The name of the puzzle is self-explanatory. Four plaques with holes in different combinations are held in a cubic shape by four pieces with pegs (one peg in each of the four sides), and all of the pieces rest in a half-cube frame, which also features holes in its walls to fit the two plaques touching it. The goal is to take all the pieces apart and try to put them back to their cubic form. Classified as a level 8/10, this will be a little bit tricky once all the pieces are mixed up. Also, both the plaques and the pieces can be flipped and rotated, so it all adds up to a high number of positions. 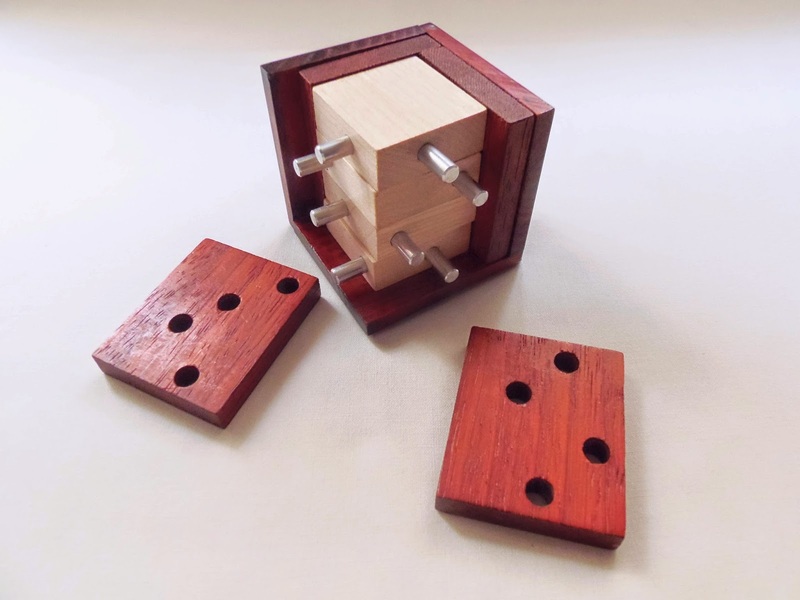 The puzzle itself is very well built with natural wood (hence the higher price). The plaques have a darker tone whereas the square pieces have a more lighter color, giving it some contrast, so the puzzle doesn't appear as a cube of the same color. Note that the colors may vary from the pictures, as you can see from mine and PuzzleMaster's. The dimensions are just right, neither not too small nor too big, measuring 7x7cm (2.8"). Solving the puzzle may seem a bit intimidating at first, due to the different configurations of the plaques and the possible high number of combinations, but it's actually not that complicated. The idea is to go by a process of elimination. You should start by trying to fit the first piece with all four plaques around it. Bear in mind that sometimes more than one piece will fit in a 2-plaque configuration, so be prepared to make changes as you progress. If you get stuck by the third or fourth piece, try to put a different piece at the bottom, and so forth. Since there's only four pieces, you shouldn't be looking at more than an hour's worth of puzzling. It took me about 20 minutes to solve it, and I never felt frustration kicking in. Once you have the plaques all in their positions you still have to place them correctly in the frame, but here you only to make a couple of rotations until it all fits. 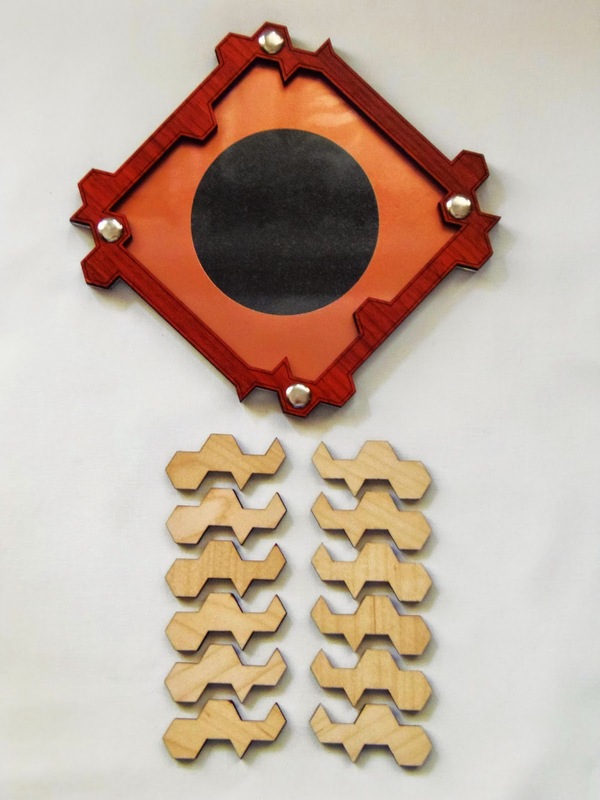 Constantin's 4 Plaques is a nice change of pace from his 2D puzzles and presents a different kind of challenge. The quality, as always, is unquestionable and that will reflect on its price. It's nevertheless a great puzzle for any collector or serious puzzler. 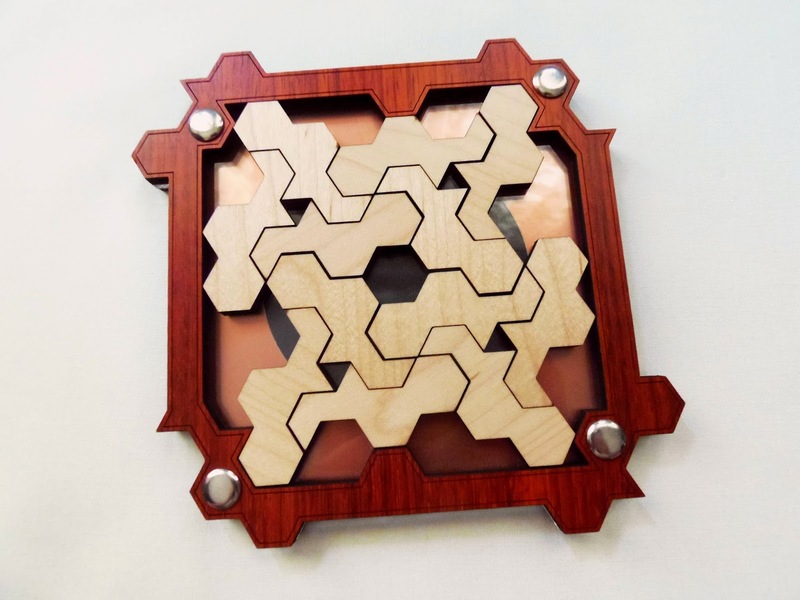 Availability: The 4 Plaques puzzle is available from PuzzleMaster for about $40 CAD.Click here for more designs by Jean Claude Constantin. A few weeks ago I got in the mail a nice package with several string puzzles, all designed and made by my puzzle friend Dimiter Vakarelov. Dimiter is a mathematician, so coming up with all these different and interesting designs comes natural to him. As you can see from the image above, his designs are highly original and, of course, quite difficult. I'm going to describe in more detail one of the puzzles I already solved, the Cherries on a Stick. 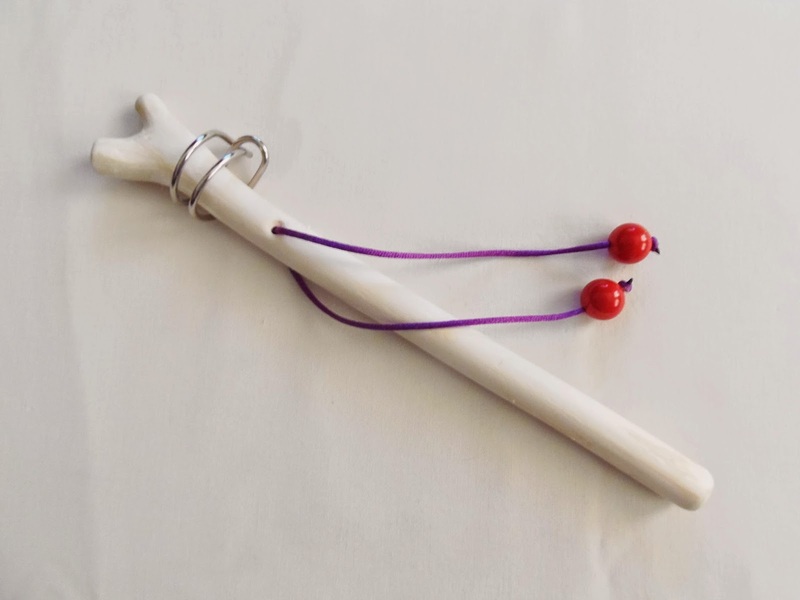 The design of the Cherries on a Stick is quite unusual, especially if you're used to the mass-produced string puzzles. Inspired by Kirill Grebnev's Attached Ring puzzle, Dimiter decided to use for this puzzle an actual wooden stick from natural wood. Only the wood bark was peeled off, leaving a beautiful natural color. 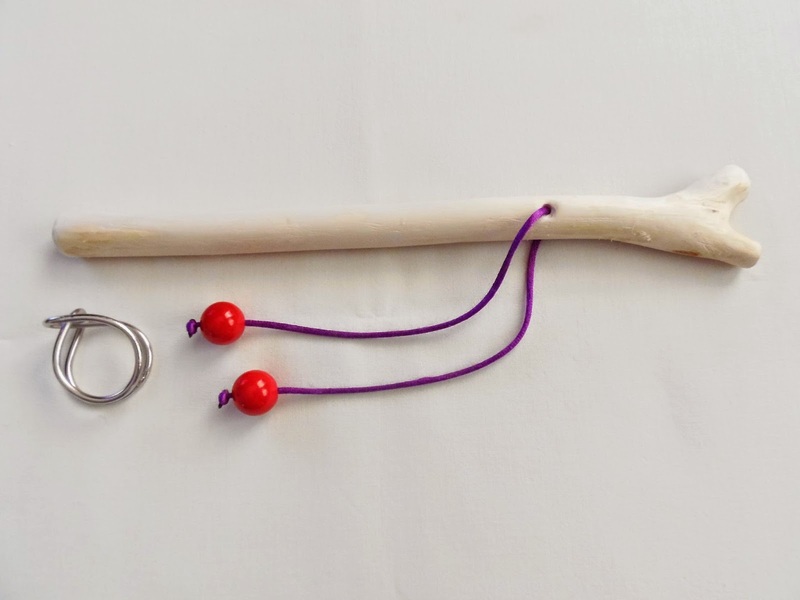 The rest of the design is complemented with two bright red beads and a highly malleable string, which is actually quite useful in the solving process. The main piece - the one you're supposed to remove from the puzzle - is an odd-shaped metal ring that moves somewhat freely along the stick's length. The goal of the puzzle is pretty straightforward. As I mentioned above, all you have to do is find a way to remove the metal ring from the stick. The "how", however, is anything but straightforward. Keep in mind that even though this was the first of the seven I've managed to solve, it doesn't mean it's easy. It just means it's easier than the others. In terms of difficulty, I'd say it's around a level 8/10. So, how do you solve this thing? On one end, the stick stretches out in two opposite directions, making it physically impossible to remove the ring from that side. That means the ring has to come out from the bottom end of the stick. The only problem is that both Cherries prevent that from happening, since the string is too short to guide the ring all the way to the end. That's when a couple of tricks involving the string and the ring come in handy. The idea is to free one of the cherries from the ring, which in turn frees all the string's length enabling you to slide the metal ring out of the stick. It's not easy to discover this process, although with a lot of experimentation and persistence you'll start to see it from another perspective. It took me a few hours to solve this puzzle and, on the first time I was able to remove the string I didn't have a clue how I got there. I managed to reset it after much trial and error, and after another dozen times solving it, I am now able to understand what's going on. I could still be solving it with an extra step or two, but I can do it fairly easy now, both the solving and the resetting parts. Dimiter's Cherries on a Stick is a brilliant puzzle. I've never seen anything even remotely similar in my six years of collecting. Both the design and presentation are flawless, and because it's handmade it has even more meaning for me. 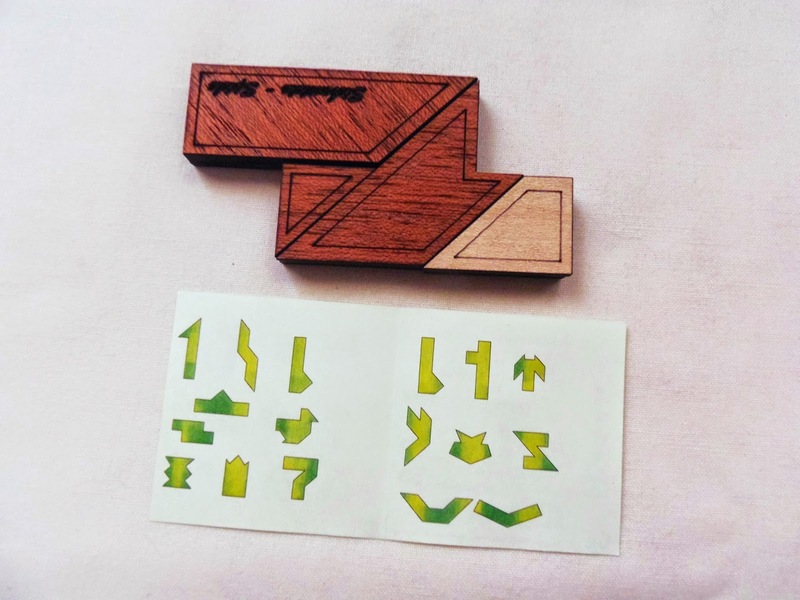 Availability: Dimiter produces his puzzles in very small quantities, and in some cases he might need some time to make extra copies, but if you're interested in any of his designs drop me an e-mail and I'll send you his contact. SmartGames is fast turning into one of the best companies that produce the ever so popular multiple-challenge games. Also present in the virtual world (PCs, Tablets and Smartphones) just as much as their games in the physical form, it's no wonder they're taking the games' market by storm. I'm a sucker for these logic games and I own many of them in my collection. My latest addition is the new IQ Link, designed by Raf Peeters, who's responsible for most of the SmartGames' creations. What captured my attention right away were the colors and shapes of the pieces, which are quite unique in this type of games. The colors are vibrant and have this transparency that absorbs light from all angles and gives them an extra shiny look. 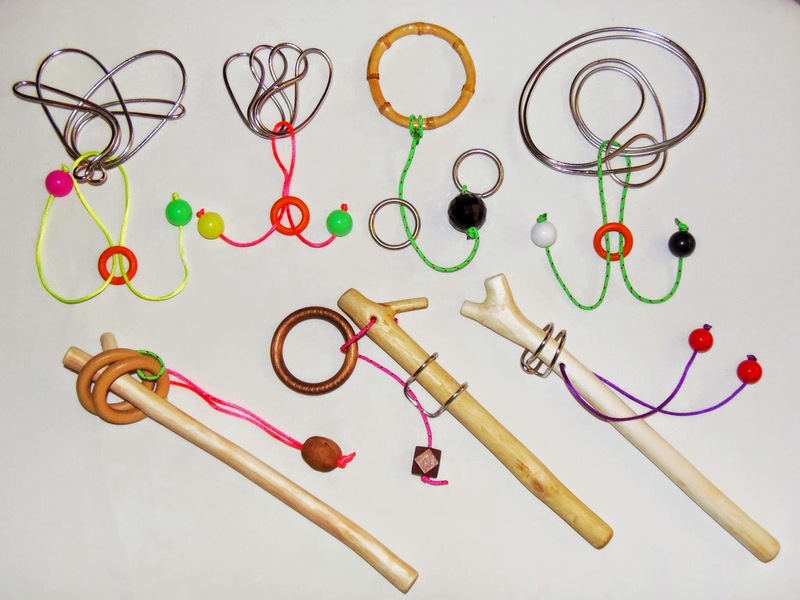 The pieces consist of three parts and each one features a different combination of them: these parts can be a closed ring, an opened ring or a ball. There are 12 pieces and a total of 36 parts, and all of them have to be packed inside a frame with space for only 24 parts. How will you do that? You have to find ways to link the pieces so that some of them will occupy the same space (like a ball linked to an opened ring). There are a total of 120 challenges - which is a lot compared to other games in the market - and they're divided in five different levels of difficulty, giving you a sense of progression as you work your way to the hardest level, Wizard. The challenges start out very easy, with most of the pieces already placed inside the frame. All you have to do is find a way to link the remaining pieces in the few spaces left. As you progress into harder levels, the number of pieces already packed will slowly decrease until only a couple of them lie scattered in the frame. The last challenge (#120) only shows one piece in the frame. 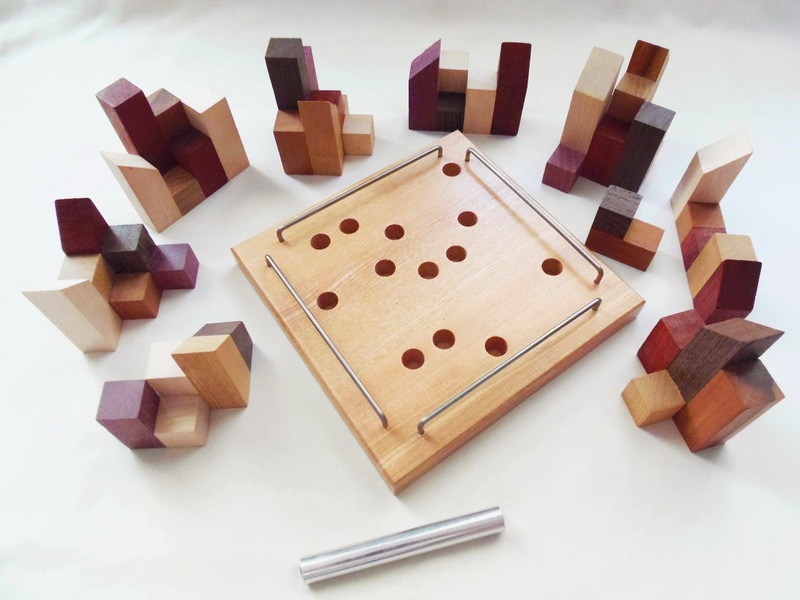 These games are described to develop logical thinking skills, strategic planning and visual and spatial perception. While they won't make you smarter, they'll certainly help to keep your brain healthy. 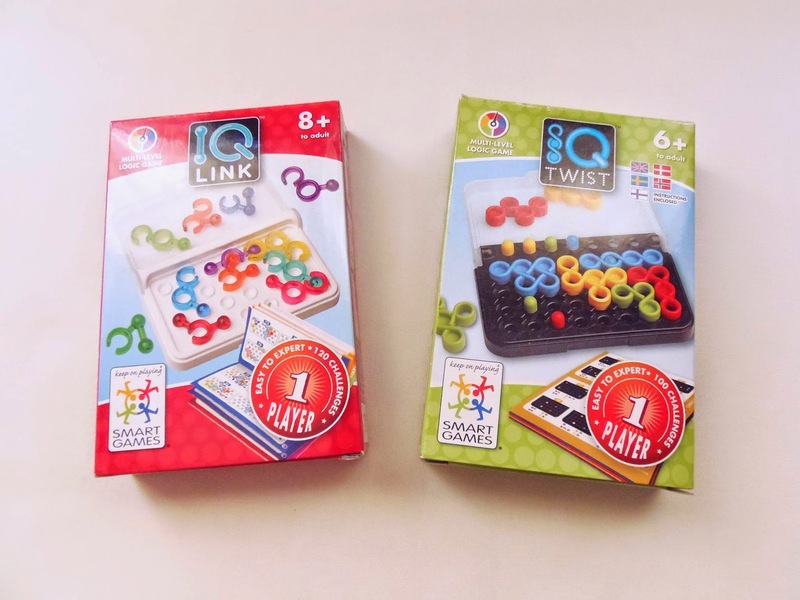 To my knowledge, there are three games in the IQ series by SmartGames: the IQ Fit, the IQ Twist and the IQ Link. By what you've read, it shouldn't be a surprise then, which one is my favorite. I strongly recommend these games to anyone, because the different levels of difficulty cater to any skill level. Raf Peeters is a genius and I look very much forward to find out what his next big game will look like. 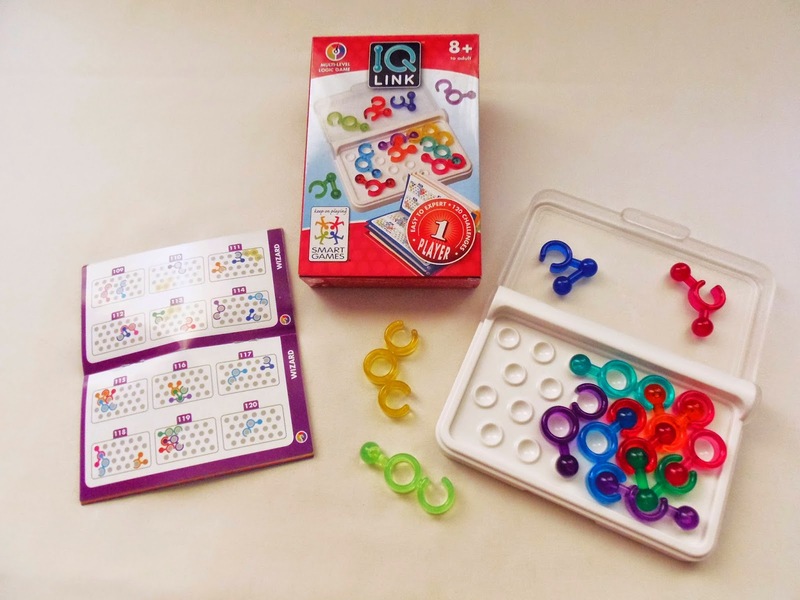 (Click to Enlarge) - Why can't a 6 or 7-year-old play IQ Link? Availability: PuzzleMaster is the place to find everything SmartGames. The Tangram has been around for so long that it is believed to have originated over 4000 years ago in ancient China. 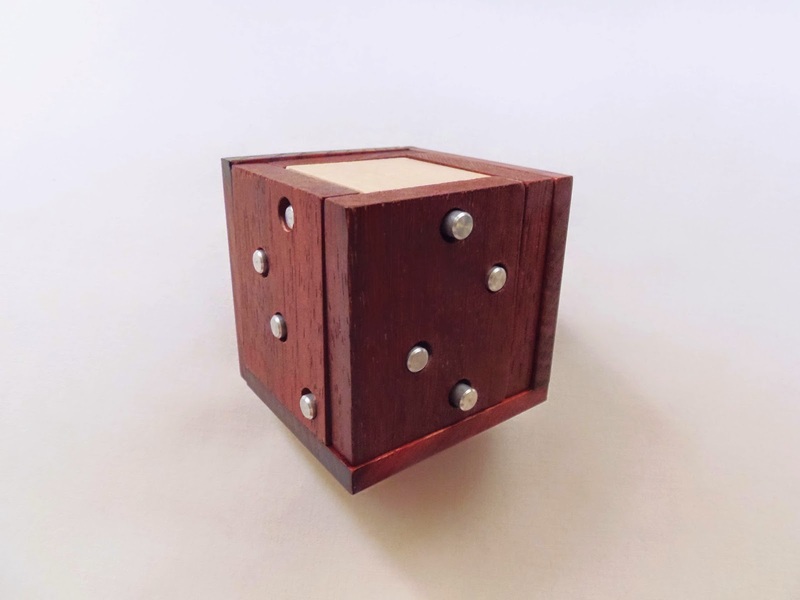 While that may be an exaggeration due to folklore, it is no doubt one of the first puzzles ever to be invented. The puzzle has inspired so many variants over the centuries that it's impossible to name all of them. 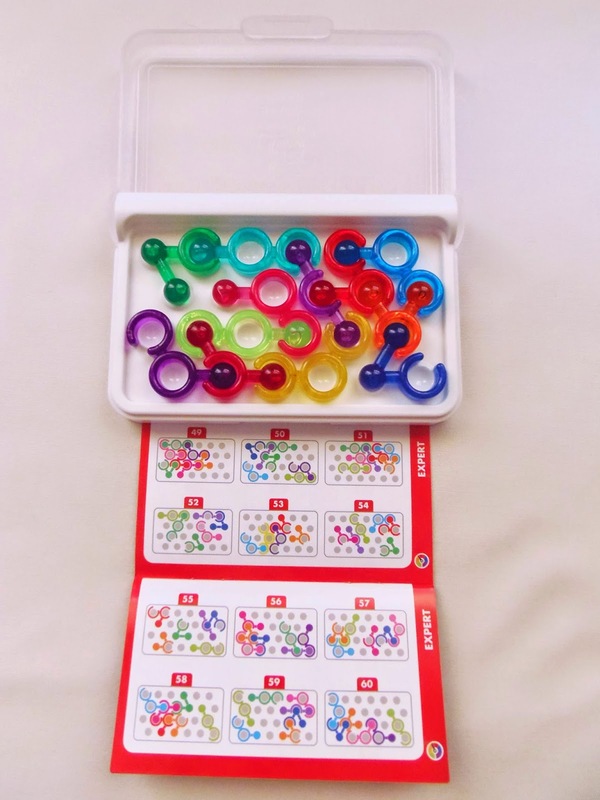 In this review I will show you a cool and simple puzzle made by the Siebenstein-Spiele's main designer, Jürgen Reiche, the T-Puzzle. What mainly differentiates the T-Puzzle from the original Tangram, besides the shapes themselves, is the number of pieces. The T-Puzzle only has 4 pieces, as opposed to the 7 pieces of the Tangram. Does that make it harder or easier, you may ask? I believe it's neither. 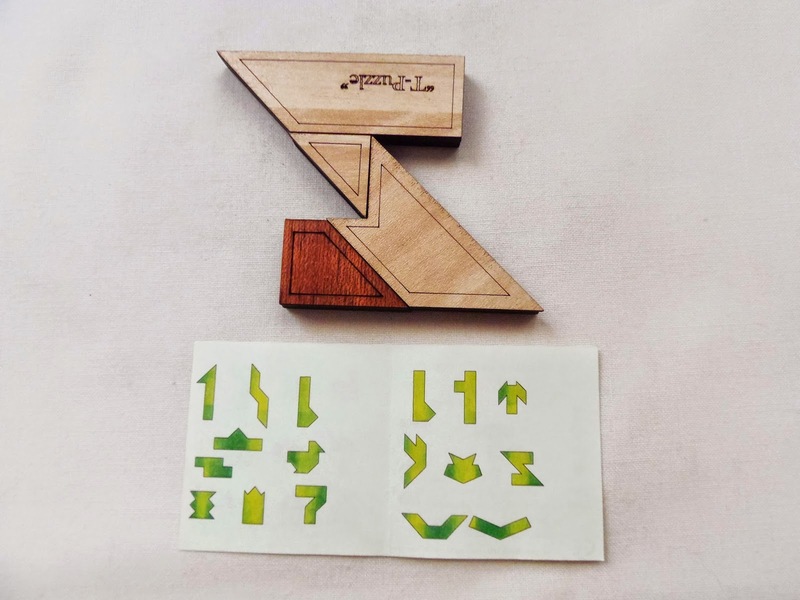 The difficulty level is about the same between the two puzzles, simply because the goal is the same: to solve one of the many different shapes you can only count on the silhouette of the shape, since you can't see the outlines of individual pieces. That's what makes the puzzles so challenging. As expected, like in a Tangram variant, you can build countless shapes with the four pieces provided. 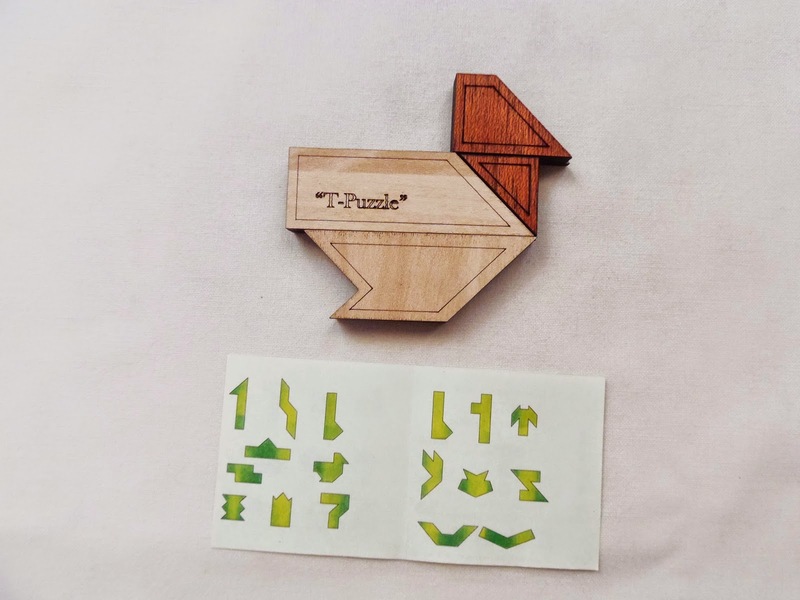 The description does mention that the main shape you should try and solve is a T, but it also comes with many other interesting shapes to build. The possibilities don't end there, since you can also come up with your own shapes. Although most of the shapes are challenging to solve, the difficulty varies slightly from shape to shape. 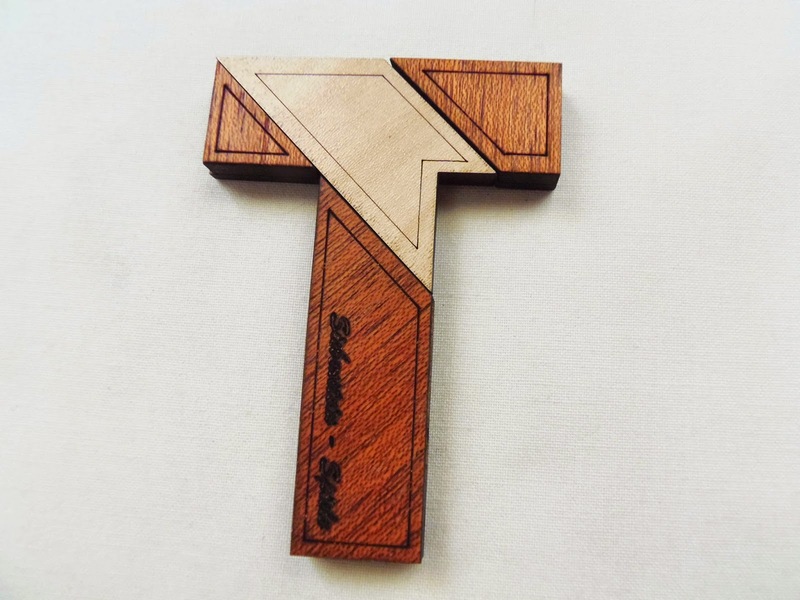 The main challenge, which is to build the letter T, is actually rather easy, but there were others much harder to solve, some even look impossible to create with just those four pieces. The shape that you see in the tray, the arrow, is the easiest to make, simply because you can use the edges of the tray to your advantage. The pieces have two colors, but when you're trying to solve a particular shape don't mind the colors, because more often than not the final arrangement of the pieces will be a mixture of both light and dark colors. 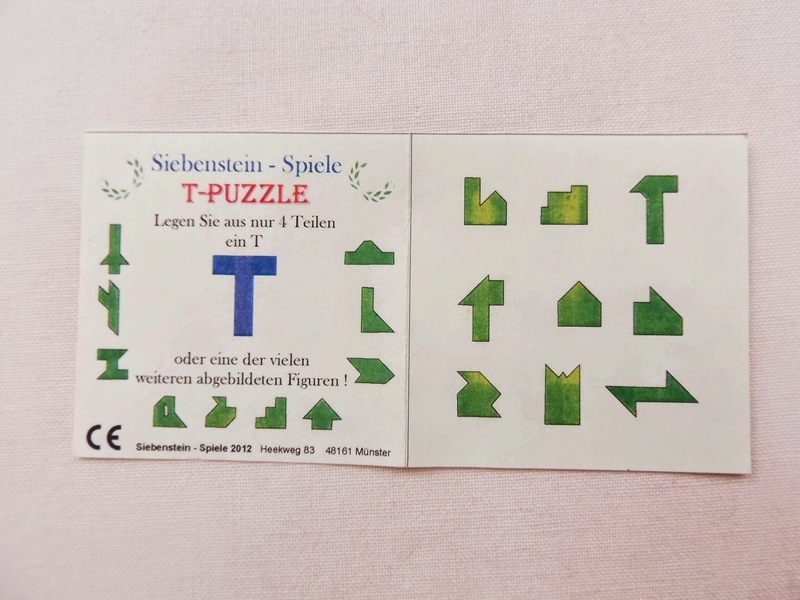 Update: Unlike I first thought, the T-Puzzle wasn't developed by Jürgen Reiche, but actually by the late Nob Yoshigahara, known as Nob's T Puzzle. Jürgen only updated the design to include pieces with two sides of different colors. The T-Puzzle is an excellent puzzle to keep around, as you can always build something different every time. Like the Tangram, it can create more shapes than you will ever build, and you'll also be tired of it long before that. 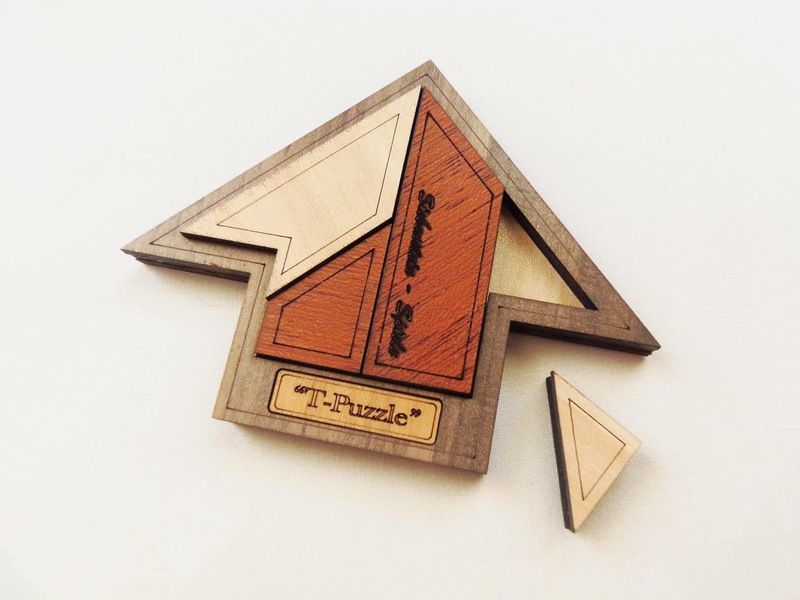 Availability: PuzzleMaster is the place to get a copy of the T-Puzzle. 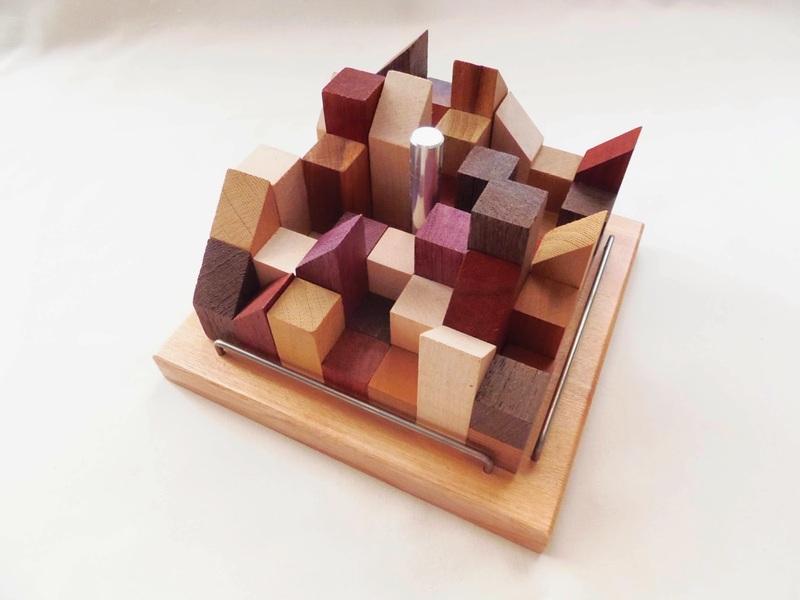 They also have many other interesting puzzles by Siebenstein-Spiele. With a very cool design, also to be expected by Constantin, Bloß Nicht Schwarz Sehen will be quick to draw your attention, as its particular geometry and uniquely shaped pieces have a way to mesmerize even the most oblivious. The tray is made with a combination of laser-cut wood and acrylic, and a reflective sheet of special paper makes the mirror effect really stand out. This effect isn't made for merely aesthetic purposes, though. Its use is actually very important for both the goal and solution of the puzzle. 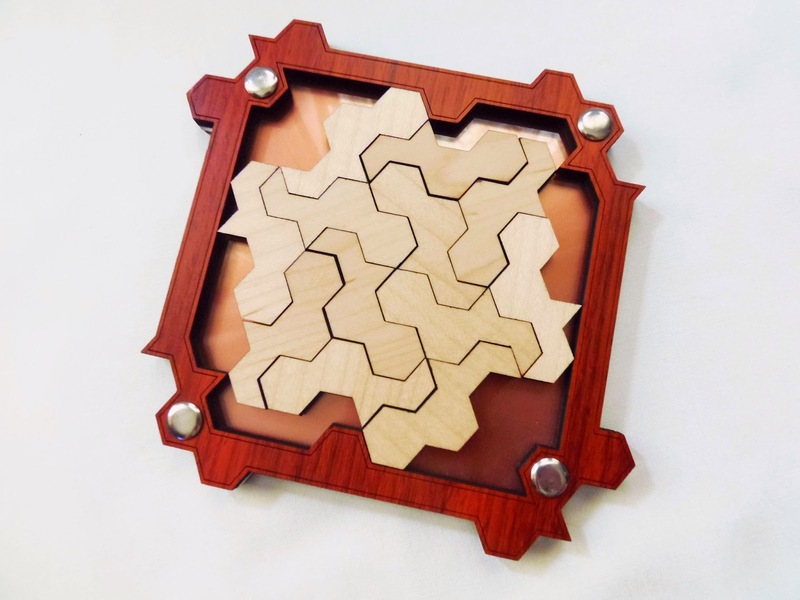 The 12 pieces are all identical (each a combination of 9 rhombi) and they're also made with laser-cut wood, but in a different color for a more dramatic effect. The puzzle measures about 13.8cm (5.4"). Note: The puzzle I received has a different color combination than the photo on the website, but it's basically the same puzzle. So, as the name suggests, you are expected not to see black when the puzzle is solved. What does that mean exactly? Well, the puzzle comes in a state that looks solved but that's actually not the main goal. As you can see from the first photo, the pieces are scattered around the tray, but in a way that let's you see some parts of the black circle in the middle. The object here is to rearrange the pieces so that no parts of the circle can be seen. The solution is also symmetric, but in a different form. When solved, the pieces should not be able to move freely around the tray. The puzzle is somewhat challenging, but not to a point of frustration. The pieces are identical, so that part is a plus. You only need to worry about rotations and flipping them - The solution requires using half the pieces on one side and half on the other. To my knowledge, excluding those rotations and flips, there's only one solution. Bloß Nicht Schwarz Sehen is a great puzzle. Not because its concept is completely new - I've seen some puzzles that use this cover concept - but because its design is absolutely stunning. The presentation of Constantin's puzzles are always perfect and this one's no exception. Definitely recommended for collectors and enthusiasts alike. Availability: You can get a copy of the Bloß Nicht Schwarz Sehen at Brilliant Puzzles for about $30. You can also see here other designs by Constantin. Skyline is a fascinating and dynamic packing puzzle designed by the talented Jean Claude Constantin. 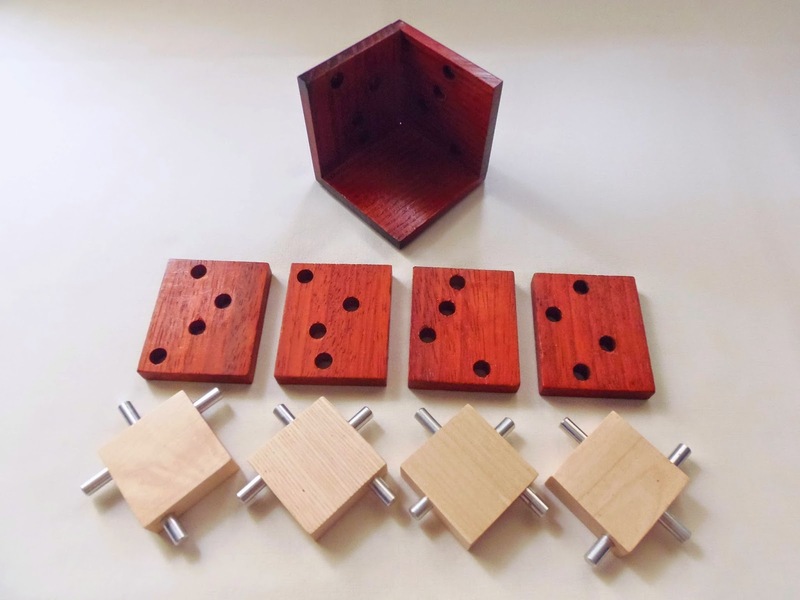 It's a dynamic puzzle because it has many solutions depending on where the metal rod is placed in the wooden tray. The Skyline puzzle is quite heavy, actually. The pieces and the tray are made from natural wood and its size is rather big, measuring 18cm x 18cm (7.1"). Constantin also uses various colors for the pieces, giving the impression of an eclectic ensemble of buildings and high-rises. 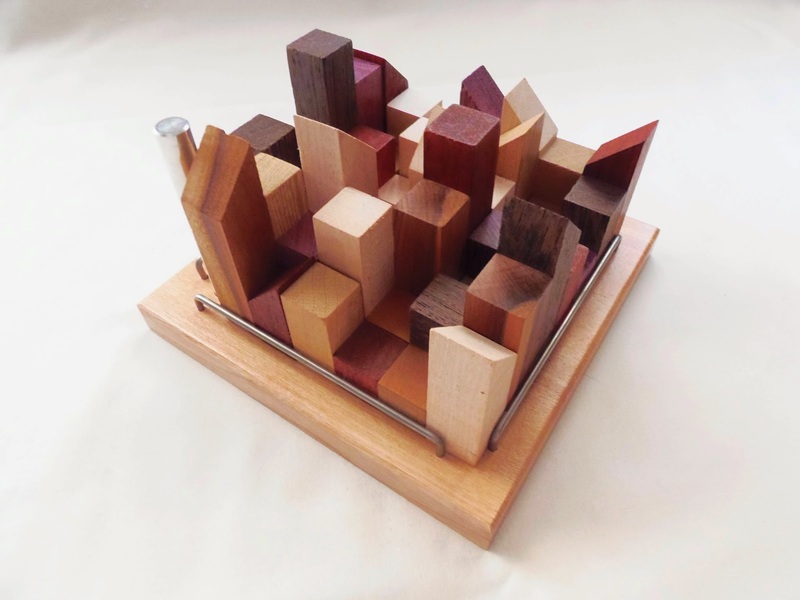 This puzzle has a very interesting concept, since you can alter the way the "Skyline" looks. For that, there are 13 holes in the base of the tray where you can place the metal rod. Once you have chosen a spot, the goal is to place the pieces around it and occupy every empty space. The area of the puzzle is a 7x7 grid; the pieces occupy 48 units in the tray and the remaining unit is then occupied by the rod. Each piece is irregularly shaped, some with eight wooden pegs, others with only two. The pegs themselves have different heights and can either have straight or slanted tops. The appearance after solved is indeed very cool, as it's reminiscent of a city landscape viewed from afar. What could've been a simple and ordinary puzzle is actually turned into a great challenge, since it has multiple solutions. This is a perfect puzzle to have in your coffee table and because you can change how the overall piece arrangement looks you'll never have the same display pattern for too long. There are 9 pieces, so it's not a very challenging puzzle, and the pieces can have up to eight pegs. Nevertheless, one pattern can take you between 5 and 10 minutes to solve. 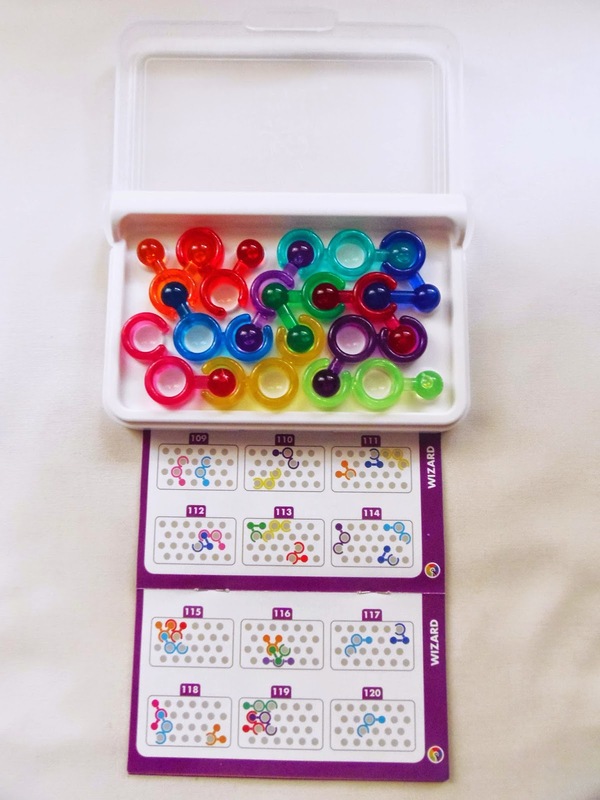 I believe there's at least a couple of solutions for each of the 13 holes scattered around the tray, since you can change the overall appearance of each solution ever so slightly by rotating and swapping a few pieces around. I know I must have said this a few times for a Constantin puzzle, but I reckon the Skyline is definitely one of his best designs to date. The idea was to create a puzzle that was able to capture our imagination, to look at it and imagine a city full of life and with a breathtaking landscape. In that sense, I believe the designer greatly succeeded. 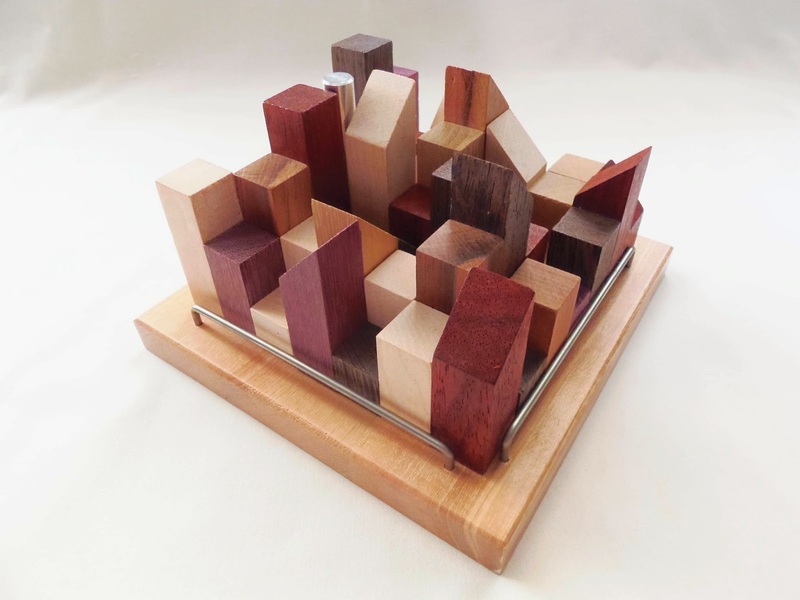 Availability: The Skyline puzzle is available at PuzzleMaster for $56 CAD. To see the range of beautiful Constantin puzzles, click here.